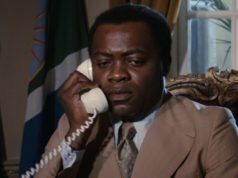 When representing his island nation of San Monique at the United Nations, Dr. Kananga (Yaphet Kotto) wears black lounge in Live and Let Die. Black lounge is made up of a black lounge coat, a black or contrasting waistcoat and grey checked or striped trousers. It’s like morning dress but with a lounge coat instead of a morning coat. Black lounge sits in formality between the lounge suit and morning dress, and some consider it to be the daytime equivalent of black tie. Whilst black tie is worn for festive occasions, black lounge can either be worn for not only festive occasions but also in certain professional settings and to funerals. The black lounge coat that Kananga wears as part of the black lounge outfit is also known a the stroller or Stresemann, named after German chancellor Gustav Stresemann. It fastens with a single button and has peaked lapels, jetted pockets and no vent to mimic the details of the morning coat. Roger Moore’s tailor Cyril Castle likely made this outfit. Though Kananga’s two double-breasted suits have narrow wrap and flared link cuffs that clearly identify those suits as Castle’s work, this suit has less to go on. Still, it is most likely Castle’s work. It has a very similar silhouette to Kananga’s double-breasted suits, with the jacket’s full chest, closely shaped waist and low button stance. It also has the same narrow, strongly-padded shoulders with roped sleeve heads that Kananga’s double-breasted suits have. 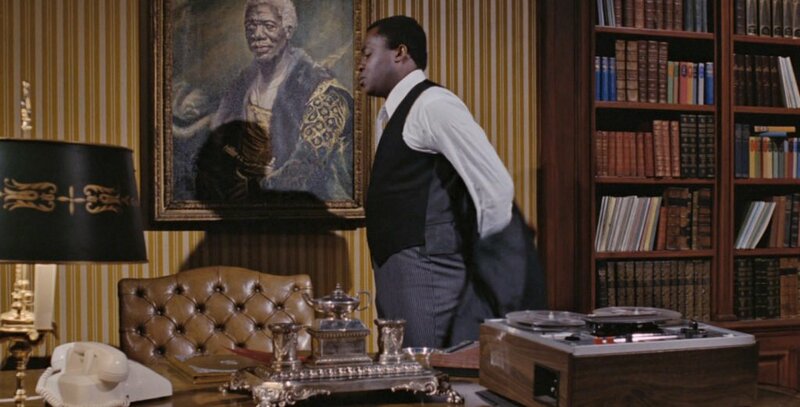 Castle padded the shoulders of Kananga’s suit jackets much more than he did for James Bond’s suit jackets to make Kananga look more like the powerful leader of an island nation. The shirt collar should always be worn under the waistcoat, but sometimes clothes fall out of place. 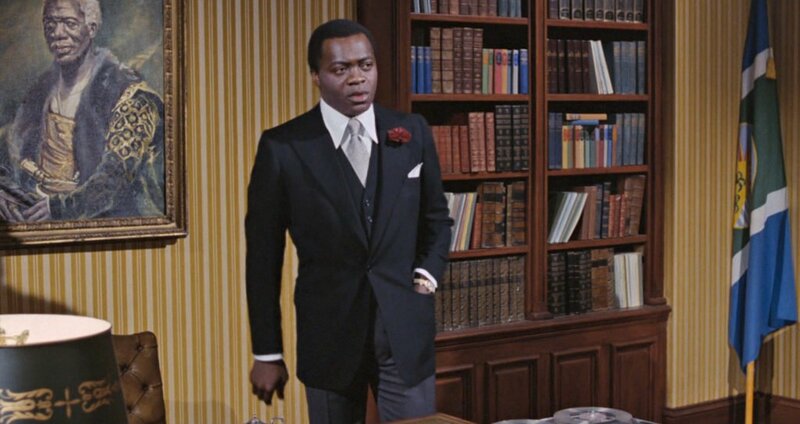 Kananga’s waistcoat matches the lounge coat in black, and the black waistcoat is appropriate for the serious occasion of attending United Nations meeting. A light-coloured waistcoat, like the light grey waistcoat James Bond wears with black lounge to his own wedding in On Her Majesty’s Secret Service, is a better alternative for festive occasions. The waistcoat fastens with six buttons and has a regular notched bottom. The trousers are medium grey with black stripes and have a darted front. 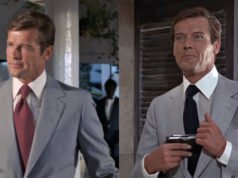 The trousers’ front darts are fairly long and placed above the crease, just like on Roger Moore’s Cyril Castle trousers, so this gives another hint that these clothes were tailored by Castle. 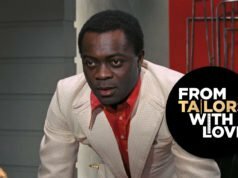 Under the black lounge jacket, Kananga wears a white shirt from Frank Foster with a long point collar and mitred two-button cuffs. Such a dressy outfit should require double cuffs, but in this more business-like setting the button cuffs aren’t entirely inappropriate. The tie is silver with a fancy self jacquard-woven pattern that is difficult to make out. Kananga ties it in a four-in-hand knot. He also has a white linen handkerchief folded in his breast pocket with two corners pointing out and a red carnation in his lapel. Although an outfit which is appropriate for the occasion, it is harmed by the overlarge shirt collar which makes Kananga’s head appear larger than it really is. That exemplifies how a classic ensemble can be ruined by the influence of fashion fads. The stroller / Stresemann suit belongs to formal wear which has always been subject to rather strict rules which should be followed. And normally one should wear French cuffs with a stroller suit but I think in this case it’s only of minor importance. Though the collar is indeed on the large side, what actually is responsible for making Kananga’s head look large is the suit jacket’s narrow shoulders. A smaller collar would only make his head look larger. BTW, that passage threw me as an American kid. I pictured a “football” differently, and imagined Mr Big’s head coming to a point! A very classic outfit. Only the shirt collar has too long points ; otherwise, I wouldn’t mind wearing the rest of the outfit at all. A very classic, occidental style. Matt, what do you mean by the waistcoat ‘has a regular notched bottom’ ? The bottom has the typical little cutaway. I put that in since Cyril Castle made Moore many straight-bottomed waistcoats in The Saint. Lapels are a bit wide for my taste,but the coat is very classic and timeless. I like the strong but not wide shoulders. ” it’s like morning dress but with a lounge coat instead of a lounge coat” ???? It should read “a lounge coat instead of a morning coat”. It’s fixed now. Is the back of the waistcoat longer then the front? In the last picture the back appears to extend a couple of inches below the front. My favorite part of this outfit is probably the ridiculously large mitred cuffs on the shirt. Thank you for pointing that out. It’s fixed now. The back of the waistcoat does indeed extend past the front, though the front is longer overall. This is probably done for better coverage in the back whilst making the front shorter on the sides for comfort. Nice outfit and overall, well tailored. It lends Kananga an air of gravitas which is designed to enhance his role as leader of an island in the Caribbean. Also, it starkly contrasts his persona with, and sets him apart from, the Mr. Big alter ego whom we are introduced to shortly after these scenes and this, I suppose, makes the later revelation more so. I haven’t seen any leaders in reality wear such an outfit though but perhaps in the 1970’s it did occur. Nowadays, he’d probably appear in a lounge suit and open neck shirt as this complete lack of gravitas seems to be a look favored by many leaders (Greece for example) when appearing at EU events. Interesting article, David ! Thanks ! I quite agree with Kotto and Moore about this topic. Back to the subject, I think we may see black lounge worn by leaders in Japan , and perhaps Switzerland and Austria. That’s only my two cents, but I am quite sure about Japan. If the filmmakers killed off or retired Craig’s Bond and made the codename theory canon, then Elba playing Bond would be excellent. A little before my time, but President Reagan wore black lounge for his first inauguration in 1981, and it was the last time the U.S. president has done so. I wonder how long it will be until we have a president take the oath in an open-collared shirt– then again, perhaps that’s not exactly practical attire for January! If Seymour was born thirty or forty years earlier,would be a great star in Hollywood,as Ingrid Bergman or Joan Fontaine. She was not a 70s type. Le Chiffre, The whole “Black Bond” idea seems to me gimmicky and wholly absurd. For me, the introduction of a black actor would remove the staunchly British character so far from his literary, and indeed cinematic, origins that he would no longer remotely resemble the established template for the character. In effect, he would be Bond in name only and would be a version which would make a mockery of both the intent of his original creator and the two men who brought the character to life for the cinema going public over fifty years ago now. I can’t imagine Cubby taking such a thing remotely seriously as he quickly rejected the studio’s idea of an American actor taking the role after Connery quit in 1972. Interesting about Japan. They have a tradition, of course, for formality so that would make sense although like everywhere this is diluting there also, I think. The “Black Bond” idea is beyond gimmicky – it is pandering to the multicultural Left. I find interesting that nobody is clamoring for a black Sherlock Holmes or an Asian Superman. Any thoughts as to why that might be? Ever seen Branagh’s Much Ado About Nothing? Colourblind casting can have excellent results. Also, Dan: the American adaptation of Sherlock has Lucy Liu playing Watson, and Ultimate Marvel has an African-American Spider-man. Maybe not Holmes and Superman, but the equivalents are there. Though as stated, I feel a black Bond would only work if explained in-universe. Dan, I agree completely. So many people don’t obviously like the old adage “if it aint broke, don’t fix it”. Is the Bond formula broken?? Dent, there have been many “reimagining’s” of classics, indeed many of Shakespeare plays and also many mistakes. Of course, one man’s mistake/gimmick is another’s “great example of modernizing”. 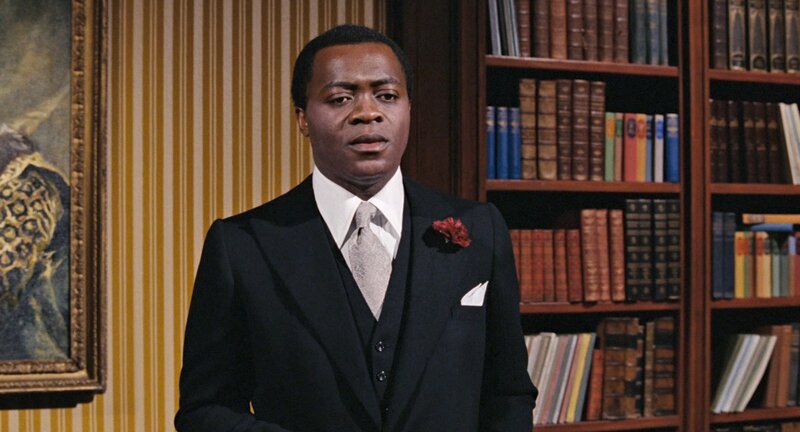 For me, a black Bond is akin to having Hamlet played by an Oriental actor. Jon, what you say is absolutely true and I have read this also. However, the comment I made about the studios and American actors (Burt Reynolds and Paul Newman were mentioned as replacements for Connery) is also on record. I’m not sure how one squares the two, I agree. David, I’m in agreeance that Bond should be played by a white actor – the Character is explicitly of Scottish/Swiss ancestry, and changing his race would provide an insurmountable continuity problem. What I meant to say is that colourblind casting has had excellent results in other adaptations, be it Shakespeare, Stephen King (Morgan Freeman in The Shawshank Redemption), or Marvel adaptations (Michael Clarke Duncan’s excellent performance as Kingpin in Daredevil). Not to mention, Jeffrey Wright’s performance as Felix Leiter is beloved by the fandom, and no one has complained about Naomie Harris as Moneypenny. The question in my head isn’t whether an Afro-English actor could play Bond (Elba certainly has the chops), but whether they should (the character is explicitly white in this continuity, and Elba has ruled out the part). Also – if Kurosawa and Welles can do well-received Japanese and Haitian interpretations of Macbeth, why can’t an Asian actor play Hamlet? Actually, Cubby hired an American actor John Gavin to replace George Lazenby in Diamonds Are Forever, but they wooed Connery back at the last minute. Gavin supposedly was paid his entire salary anyway. I believe Cubby was more insistent on British directors than anything else. My point was that ” nobody is clamoring for a black Sherlock Holmes or an Asian Superman”, emphasis on “clamoring”. People are clamoring for a black Bond, I suspect, to figuratively stick a finger in the eye of Bond’s perceived conservative, British Empire, old school tie image. I find it interesting that everyone assumes it is some politically correct agenda from the left. It’s more to do with the fact that Idris Elba is one of the most talented English actors of today and has played James Bond type characters before. Not to mention, he would bring a lot of the charisma that is missing from the role lately. (I like Daniel Craig, don’t mistake my words, but miss that aspect of the character.) Idris Elba being a “black Bond” should be no more a big deal than having Daniel Craig being the “blond Bond”. Remember when that was a huge deal for a vocal minority on the internet in 2006? Yeah, barely anyone remembers that now.